We exchanged presents this morning and now Miss Kathy is busy whipping up a Christmas dinner that has had me and Tuco the Dog begging for tidbits and drooling since 10am. When the gifting was going on, something got stuck in my mind like dog hair to velcro and I just had to write about it. 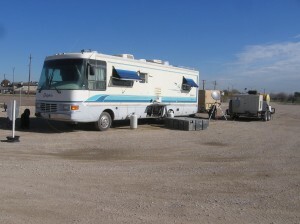 I coined the term industrial boondocking last year to more correctly describe how an oil field gate guard is able to survive out in the boondocks. It is not like we are camping in a National Forest or a Corps of Engineers primitive campsite which is boondocking in the purist sense of the word. We have industrial amenities like the fresh water tanks and septic and such that make the living conditions….well, livable. 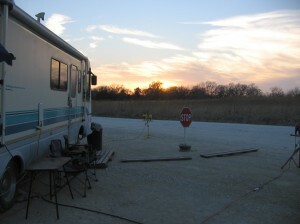 Many of my gate guard friends do not even have a generator for their RV or even a single solar panel so again, the industrial boondocking tag seems to be a better descriptor for how we survive in the oil patch. So while we were opening our gifts this morning the full realization of how our lifestyle has changed hit me in the brain. 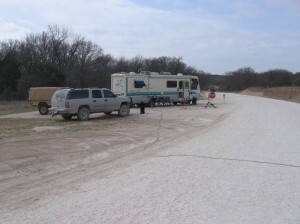 It has been a quantum life shift from Sticks and bricks > recreational RV use > RV fulltimer > Industrial boondocker. The foo-foo frilly things that adorned the sticks and bricks and made the trip to the RV initially were pushed farther and farther back, unused and unneeded, into dusty recesses of the Old Girl. Most of them ended up in storage or given away to one of the kiddoes who still did foo-foo frilly. The valuable space they had once occupied was filled with a needful item that served a needful purpose. Old boots, new boots, Tuco the Dog don't need no steenkin' boots! It was the nature of our gifts this morning that drove the point to home. Throughout the year, I will be reading a blog or a forum and see reference to an item and think to myself ‘That item would be useful or make our lives easier.’ I dutifully add it to my Amazon Wish List for later reference. At some future date when the bank account has an extra peso or two, I will go down the Wish List and decide which of the items is most needful and what is affordable. Miss K has made me a believer in buying quality products once and the premium price is soon forgotten. My Christmas booty was almost exclusively from the Wish List. Miss K gifts a bit differently but it is the same basic concept. She gives one present you need, one you want and one you wish for. 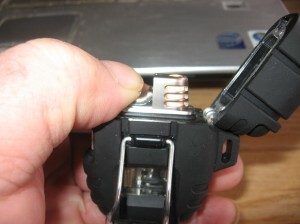 Delta Windmill butane lighter-- I think you can weld with it too.. The end result is similar. 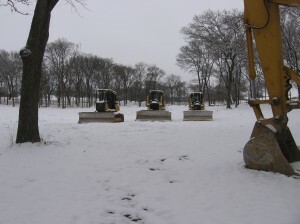 You end up with items you use or that make life in the oil patch just a tad easier. I call the whole process Living Close to the Real as opposed to Living Close to the Edge. We are not living on the edge by any means. We have all the conveniences of a happy suburbanite in some form or fashion. The difference is I know were my water comes from and if I want to keep the water flowing that tank has to have water in it and when it gets cold, I have to protect it. I will have electricity as long as that diesel generator continues to drone along after after hour. 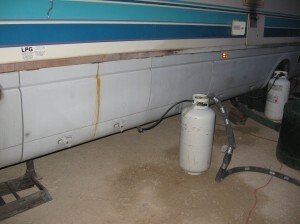 If it quits and the outside temps are 115 degrees, I have to effect the repair and ASAP. The suburbanite would not even attempt to repair a blown transformer or a downed electric line. If my genset throws a belt, clogs a filter or breaks a fuel line, I am gonna fix it and get going once again. If I can’t make the repair, I have a back up generator. Living close to the real folks — you are responsible for making it happen and a good portion of every day is spent making sure the real world does not become inhospitable. I picked up a Kindle 3G 9 months ago and cannot imagine gate guard life with out it. When you are running the gate, something that you can put down to check a truck in and then resume easily is an indispensable way to fill the long hours. 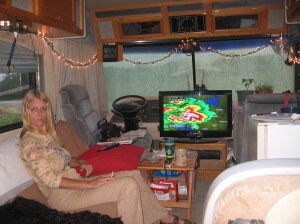 Books fill the bill but boxes and boxes of read paperbacks is not cool in an RV. The Kindle is the answer. Here lately though I was seeing less and less of my Kindle. Eventually I never saw it unless it was in Miss K’s boney claws daintily sculptured hands. Something had to give! I told Miss Kathy that since she had been such a trooper lately and she obviously enjoyed the Kindle to order her up one. 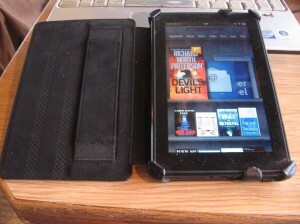 I figured she would opt for the Kindle Fire, Full Color 7″ Multi-touch Display (Amazon Link) and I was not wrong. She is such the gadget whore deluxe! We are now a 2 Kindle household and the good news is you can have multiple Kindles on the same account so we can even share the books. 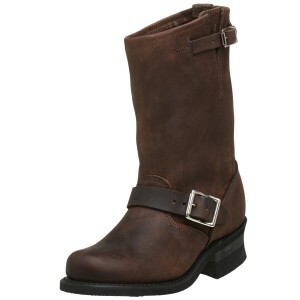 Miss K's Frye boots -- I think they are hot! Miss Kathy did not have a good pair of pull on leather roper boots. 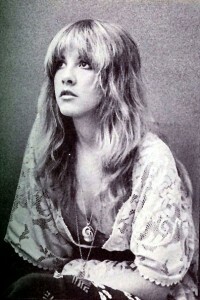 She had a pair of White’s logging boots that laced to the knee that are extreme. Problem is they could manage an entire rig move through the gate before she could get ’em on and rush outside. 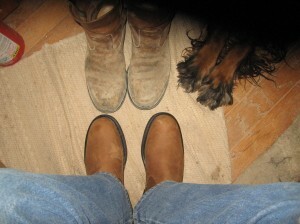 My old Red Wing Pecos boots were wore slap out so both of us were boot poor. The soles on the Red Wings had gotten so thin I could feel every gravel and stepping outside on the cold ground just turned my feet to ice. To me and Miss K, leather boots are a must in this environment. They give you some protection from things that scratch and bite, support your ankles and the rubber soles cushion that gravelly ground. When it is muddy, you just stuff your Wranglers inside the boot and keep the mud off of them. 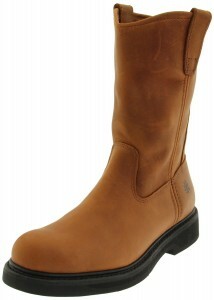 Miss K got a pair of American made FRYE Women’s Engineer 12R Boots (Amazon Link) . The Red Wing Pecos boots have gotten expensive over the years and you gotta hunt up a Red Wing store to buy ’em. Miss K came up with the Wolverine Ingham Work Boot (Amazon Link) at less than half the price and they sure do feel good on my feet. Sure worth a try at that price! All of you surely know how much Little Blondie likes to cook but she cusses the Panasonic Dimension microwave convection oven in the Old Girl with heated passion. She hates the damned thing and will danged sure tell you about it if you ask. She really has no cookering option since her only other choice is the 3 burner propane burner top. The Old Girl does not have an oven. She started planting the seed of change early in the year for something better. First off, I saw her with the measuring tape scoping out the space available on top of the baby fridge. 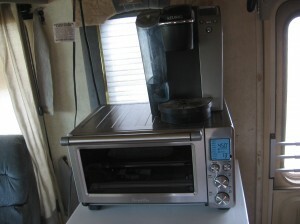 Next thing I know, this fancy assed convection toaster oven shows up on my Wish List. Well, I need a toaster oven like I need lace drawers so I knew I had not put it on the list. Took me a bit to put it together it did. Boys, you best be watching those sly women. 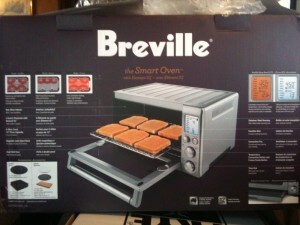 What UPS Santa dropped off to me was a Breville Smart Oven 1800-Watt Convection Toaster Oven with Element IQ (Amazon Link) . I was reading up on this thing before I decided to drop the cash on it and it is definitely not for sissies. Miss K told me to make sure and say that it would cook a 13″ frozen pizza which I guess is meaningful. She hinted at the oven once or twice over the last few weeks just to make sure I was noticing it and I told here there was no way I was going to drop that kinda cash on a cheesey toaster oven. It came up again and I told her flat out no–it ain’t happening. The look on her face when she opened the box was worth the little baby lie. I don’t know if she saw through all my blustering but she sure acted surprised. The toaster oven fit perfectly on top of the baby fridge and the Keurig fits on top of it. All according to the Little Blondie Master Plan. Now I have two appliances that will draw more electricity than Honduras. Oh well! As long as she is happy that is all that matters. Last on the list is something I had hoped for but really didn’t expect. I am from the school that if you don’t have pictures; it didn’t really happen. 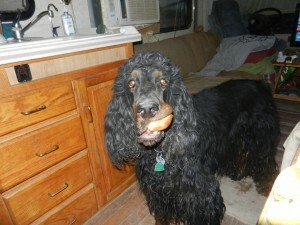 That is one reason you very seldom see a blog post that does not have several pictures included. For years uncounted I have been using an increasingly worn and battered Canon Powershot A520 . Here lately it has been fading on me pretty bad. The fine caliche dust plays hell with cameras and watches. The dust had penetrated the little lens cover thing that slides over the lens when ever you turn the camera off. Messed it up to the point I had to flick it with my finger to get it to open up. Sometimes if I was in a hurry or didn’t flick it just right, the cover didn’t entirely open. Just look at the third picture in this post of the boots and Tuco feet. See that little shadow in the upper right corner. Yep, lens cover. The lens itself was scratched up and I could tell its’ functional days were numbered. 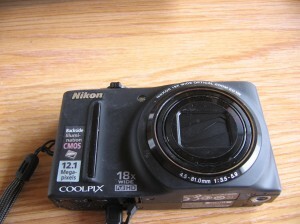 Nikon Coolpix S9100--It is dusty already! Once again Miss Kathy came through with flying colors. She got us a Nikon COOLPIX S9100 12.1 MP CMOS Digital Camera with 18x NIKKOR ED Wide-Angle Optical Zoom Lens and Full HD 1080p Video (Amazon Link) . Now I am not exactly sure what all those numbers and letters mean but it must be something good. Miss K researched different point and shoot cameras for days and this is the one she came up with. 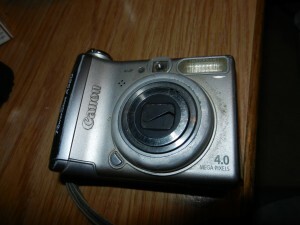 I managed to take its’ first picture for this blog which is the picture of the old Canon Powershot. The first picture from the new camera is of the camera it is replacing. Fittin’ don’t you think? One picture is all I managed because somehow or another when I first turned it on, I fat fingered a menu option and now everything is in Spanish. At first I thought Senora Blondie had bought me a Mexican camera but then I realized what I had done. I will get it figgered out sooner or later. I hope everybody had as good a day as Miss Kathy and I did. 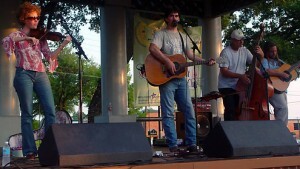 I am looking forward to sharing 2012 with all of y’all as well! Thank you for all the nice presents. You too baby. It was a nice day wasn’t it? Lace drawers…that made me laugh!! Merry Christmas to you guys. Stay safe. Andy One thing you might look into is a waterproof cover/housing for that shiny new camera That would keep the dust out while you were using the camera but it may be more effort than the camera is worth.